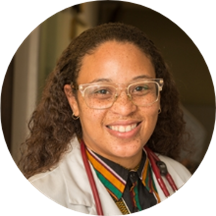 Based in Oakland, CA, Dr. Danielle Williams works at Roots Community Health Center. Dr. Williams concluded her residency in family medicine at the Los Angeles County Department of Health Services. She is a dutiful and reputed primary care doctor. Prior to completing her training, she earned her medical degree from the University of California, San Francisco. Dr. Williams is a board certified by the American Board of Family. She sees patients for a variety of reasons which include, hair loss, arthritis, pneumonia, osteoporosis, and obesity/weight loss consultations. She believes that two-way communication is the key to good health. Dr. Williams is dedicated to assuring a positive patient experience, as well as working with her team to improve quality and service. She believes in providing compassionate and comprehensive patient-centered care. Very professional and I feel confident everybody knows what they are doing. My last visit was awesome with Dr. Williams. She's a very good doctor. Good / Dr. Williams personal - she have good bedside manner and she CARE about people. "Thank you" ! Dr. Williams. Dr. Danielle Williams, MD has no appointments on Zocdoc right now.